Where do I use my M and Co voucher code? Browse the current deals available for M&Co at NetVoucherCodes. Find the deal you wish to use and follow the link to the M&Co main site. Shop online, find products you love and fill up your online shopping basket. Select ‘My Bag’ to checkout and enter your enter your code in the box labelled ‘Enter Promotion Codes’. Click ‘Redeem’ and then ‘Checkout’. 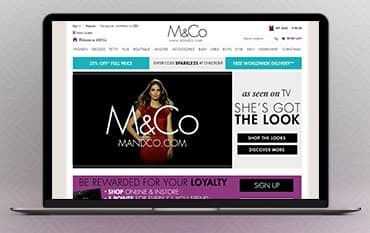 Formerly known as Mackays, M&Co have over 50 years in the fashion retail industry and are one of the largest privately owned retailers in the UK. With exclusively designed ranges, which are also affordable, M&Co pride themselves on having built a large customer base with their quality, trust and reliability. Providing top quality clothing, which is fashionable and on trend, there is something for every family member, as well as soft furnishing items for the home. Their women’s range is classically designed whilst being flattering and versatile; for added design detail and superior fabric choices then check out the boutique section! If you’re worried about the fit then M&Co has separate ranges for both petite and plus sizes. The petite range is designed to fit the proportions of women 5ft 3 and under, whilst the plus range mirrors the women's range but is aimed for the fuller figure. With a lingerie section which includes everyday underwear as well as those special items, you can complete your whole look. Add a few accessories such as belts, hats, jewellery, etc and voila! M&Co also have ranges for men and children, from newborn to teens. The men's range is modern and contemporary, whilst the children’s range has versatile and fun clothing. If you’re struggling for inspiration then take a look through their style file, which features fashion collections, new trends and inspirational ideas. Whether you’re dressing to impress this season, or you’re in search for something a little more casual, M&Co could have the perfect dress to suit your style! Browse the fabulous collection today and ensure you use our offer & discount codes to save money on your next look! Whatever the occasion, whether it be for the office or something more luxury, there is a dress perfect for dressing up or down. The superb collection of women’s dresses at M&Co features black dresses, occasion wear, party dresses, shift dresses and so much more so whatever your style, start your search today at M&Co. When it comes to pyjamas, you can never have too many, especially when you’re a child! Kid’s are always going through so many clothes that sometimes you really can’t keep up, but with M&Co, you could save a fortune with our latest offers & voucher codes. Make sure your child sleeps tight with the exciting range of sleepwear at M&Co, featuring styles for babies, boys, girls, and teens! Including designs with all your little one’s favourite characters or the super cosy, fleece range, you’re seriously spoilt for choice. Start browsing today! If you change your mind and wish to return any item(s) due to the item(s) being unsuitable, you must return the item(s) to M&Co within 28 days (14 days for sale items) starting from date of delivery in order to receive a full refund via the original payment method. How can I contact M&Co? Or use the contact form which can be found here. At M&Co, discover affordable fashion suitable for the whole family! Check out with an M&Co voucher code and fill your wardrobe with all the latest fashion staples, whilst you save money! Here at NetVoucherCodes, we keep you up to date with all the latest voucher discount codes so you can keep on trend for less. Enjoy a wide range of clothing styles at M&Co which are created to suit everybody’s preference. They even offer a petite and plus size range! If you love clothing at M&Co, you’re sure to love their homeware section too, so be sure to check it out whilst you shop.